I guess most people new to boating would start with these two parameters above all and this occupy's most of our discussion time at this stage. We have set our eyes on a minimum of 45' and a maximum of 57', based upon the logic that the lower figure is the smallest we could live aboard and the upper figure to do with cruising the whole system. We have decided that reversing in at an angle in some of the Huddersfield canal locks, is too disturbing at this stage to contemplate so will leave it out! We have a our eyes set on a cruiser back and reverse layout, for easier cup of tea delivery to the helms person and we thing that shopping will be stored easier and quicker from the large space straight into the galley. The second talking point is location, given the fact at this stage we have no idea where our future pride and joy is in fact residing, that leaves us a bit open. But we want to be within hail of our land base which is in East Yorkshire, so we are very keen on the Trent and Mersey, not too far. 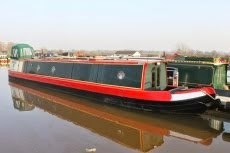 We have noted that there are a number of quality Marinas between Nottingham and Stafford, gives us a lot of scope. Looking forward to getting to the UK about September and starting to investigate in the flesh so to speak. We think that in our first year at least, we would want a home marina to trek out from, maybe a few weeks at the start and then longer tours. We think that in year two we may attempt continuous cruising but we are still keen to know we have a home base. It will be interesting to look back at this in the coming months to see what has changed in our thinking and even more interesting to see what we buy and where we end up! In January 2012 we were visiting some friends who happen to live on a boat on the river Itchen near Southampton, Dan and Mogs. They have been living on houseboats for some years now, this being their third I think. We had called them a few days earlier to arrange a visit and Dan suggested that we go with him up to Cropredy on the Oxford Canal, to move 'Little Edna', their cute little 20ft narrowboat. The time had come to move Edna North for the forthcoming year and so we set off around 6.30 am, chipping the ice from the windscreens and braving the temperature at minus 6. Brave because we actually live in the Maldives, which is a constant 31 degrees C, somewhat different eh? So we travelled up to just north of Banbury and had the most amazing day, finding Edna freezing on the side of the cut in the stunning Cropredy and travelled about 4 hours North to leave her for a few days. This was all it took for us to decide to come back to the UK to live and buy a boat of our own to spend most of our early retirement on, or so that is the plan as they say. We are now in mid May back in the heat and researching and planning like mad to realise our dream hopefully by the end of 2012. So here we go, the start of an adventure or as we are thinking, our Narrow Escape!!! Thank you for reading and we do hope you enjoy the journey with us, however long you spend with us! !